Tuesday, 12th Aug 2014. Palm oil futures went down again yesterday and this time it is big. To Make things worse, palm oil rival also dropped to multi-months low. Other news to follow. "-U.S. stocks advanced Monday, led by a rally in small-cap companies, though continued tensions in Ukraine and the Middle East put a cap on the S&P 500’s gains. The Russell 2000 RUT +0.94% rose 10 points, or 0.9%, to the preliminary 1,141.58. The index of small companies has outperformed the large-cap S&P 500 in the five of the past six sessions, and many analysts see the leadership of small stocks as a sign of improving markets. The S&P 500 SPX +0.28% rose 5.32 points, or 0.3%, to 1,936.91, Consumer staples and technology stocks lead the gains. The Dow Jones Industrial Average DJIA +0.10% gained as much as 75 points in the morning, but pared gains in the afternoon. The blue-chip index closed 16.05 points, or 0.1%, higher at 16,569.98. The Nasdaq Composite COMP +0.70% ended the day up 30.43 points, or 0.7%, at 4,401.33." "- Here are closing levels for Asia's major stock markets: Tokyo (Nikkei Average) up 2.4% ; Hong Kong (Hang Seng Index) up 1.3% ; Shanghai (Shanghai Composite Index) up 1.4% ; Sydney (S&P/ASX 200) up 0.4% ; Seoul (Kospi) up 0.4% ; Taipei (Taiex) up 1%." KUALA LUMPUR: Crude palm oil (CPO) futures contracts on Bursa Malaysia Derivatives closed lower yesterday on expectation of higher inventories and production in August ahead of Malaysia Palm Oil Board's report due to be released today. "Prices seem well-supported at RM2,400 level but any breach below this level could trigger further selling pressure and extend further weakness towards RM2,370 level. Spot month September 2013 fell RM31 to RM2,401 and December 2013 decreased RM42 to RM2,402 per tonne. October 2013 and November 2013 declined RM45 each to RM2,402 and RM2,399 per tonne, respectively. Volume eased to 29,350 lots from 30,152 lots while open interest fell to 180,260 contracts versus last Friday's 187,951 contracts." 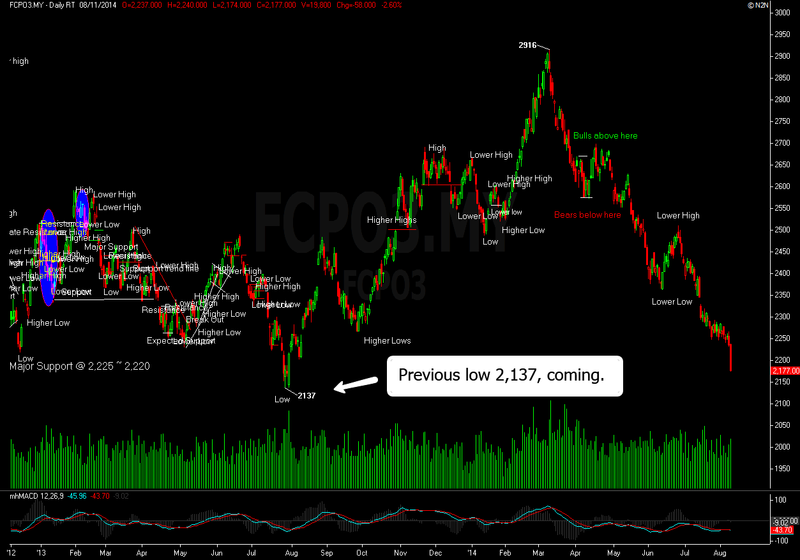 FCPO- There Is No Telling Where Is The Next Low. I might sound dramatic but dramatic is what you need if you wish to achieve success in any field. Palm oil gets the hammer down not only yesterday but for the past six months this year. Try to flip a daily chart and you will instantly see what is going on, with that in mind yesterday sell-off was actually expected. Unfortunately, only few percentage of traders would expect that to happen, traders who actually sticking to their plan and execute it. Majority does not see this down fall, to make things worse, most are going against it. To go Long in a very low or very cheap priced instrument in futures is suicide attempt because there is no telling where is the next low the price would stop dropping, none to tell whatsoever. Trend trader might having the best blast this time around, and we all know this moment is hard to come around. Both fundamental and technical reading are still suggesting Bearish market. With July palm oil output increase about 6.1%, export down 2.3% and stocks was up 1.5%, it is clear picture that palm oil direction is down. Technically, yesterday seventy points sell down might signifies that the Bearish momentum is still strong and still have more juices to go down. This weakness might just be the beginning, there is no telling where is the next support. For intraday traders, beware if you are going Long on market rebound because it will be a Short live rally. Most recovery is likely turn out to be chance to go Short. To do that, pay attention to daily pivot resistance level.